This is a clearly free program. There is no spyware or adware. It's absolutely safe to install and to run! Follow Start > All Programs > DVDVideoSoft > Programs > Free Video to DVD Converter or just click the DVDVideoSoft Free Studio icon on the desktop. The interface is very simple and self explaining. There is a field for an input file(s), a field for an output path, a size bar and the list with preconfigured presets. Click the upper Browse... button to select an input video file(s) from your computer. 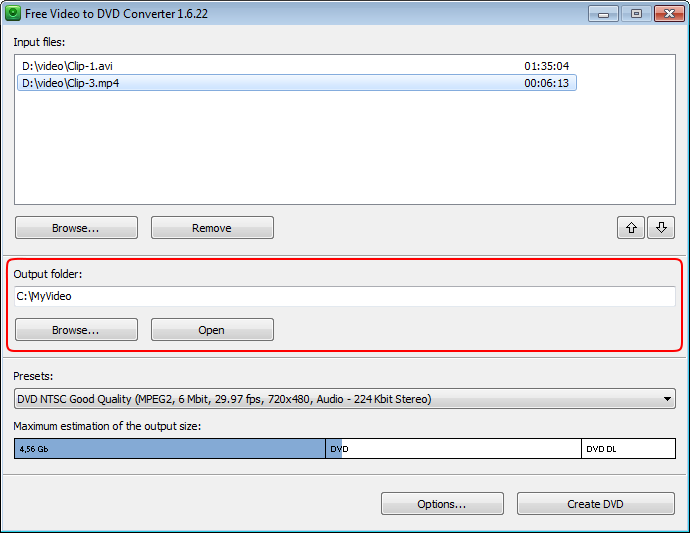 The size bar below indicates busy/total space which your converted video occupies on a DVD disc. Click the bottom Browse... button. 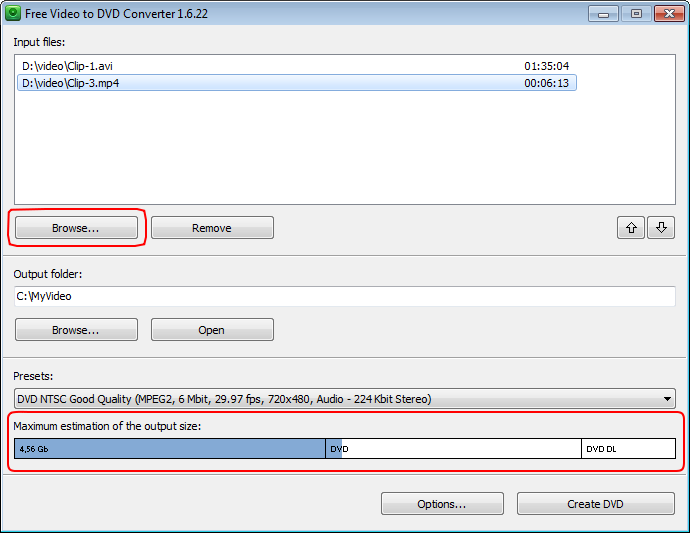 Choose the location where you would like to save your converted DVD video. Click Ok. In the list below select one of the available presets. Click the Create DVD button along the bottom of the interface. The "Choose an action" window will appear. Select one of the actions you want to do right after converting and click the Continue button. Wait for the video to be converted. Note: Before clicking the Create DVD button you can set to turn off computer after the process is completed. Just go to Options... and make sure the appropriate box is checked. 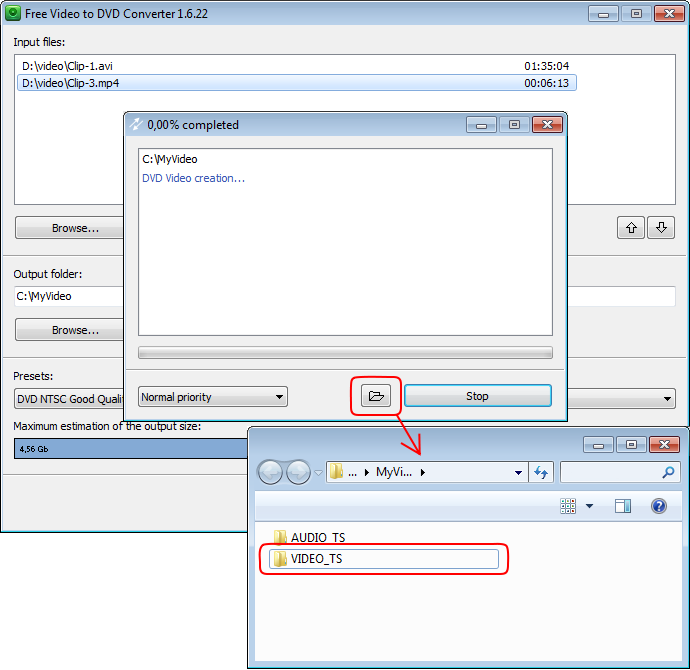 After converting is completed click a small square button with the folder icon to open your output folder. There you can find VIDEO_TS folder with a converted DVD video. If you want to burn a DVD disc you should set your input video as this VIDEO_TS folder.